The RBP shop is a 5,000-sq. ft. organized mass of used bikes, tools, and people. We are open to the public 37-50 hours a week, seasonally. 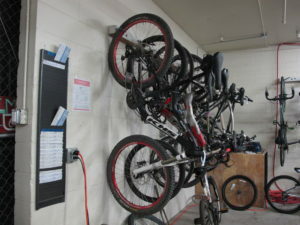 The shop entrance area includes a portion of our used bikes for sale. Stop at the welcome desk for information or to purchase an assortment of new essentials and accessories. Across from the welcome desk, we have six fully-equipped Public workstations. 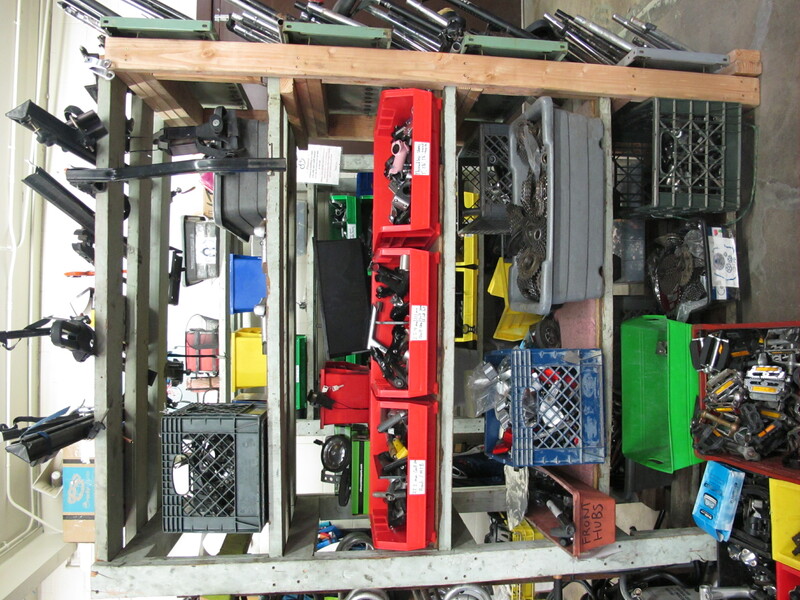 Further back you’ll find our Service Department, bins of sorted used bike parts, and lots of refurbished bikes. As a community bike shop we have an open door policy where everyone is encouraged to come work, volunteer, or simply hang out. We encourage people to take an active role and be the change they would like to see. Because of this, the shop is colorfully decorated with years of volunteer/employee input, ideas, and art. 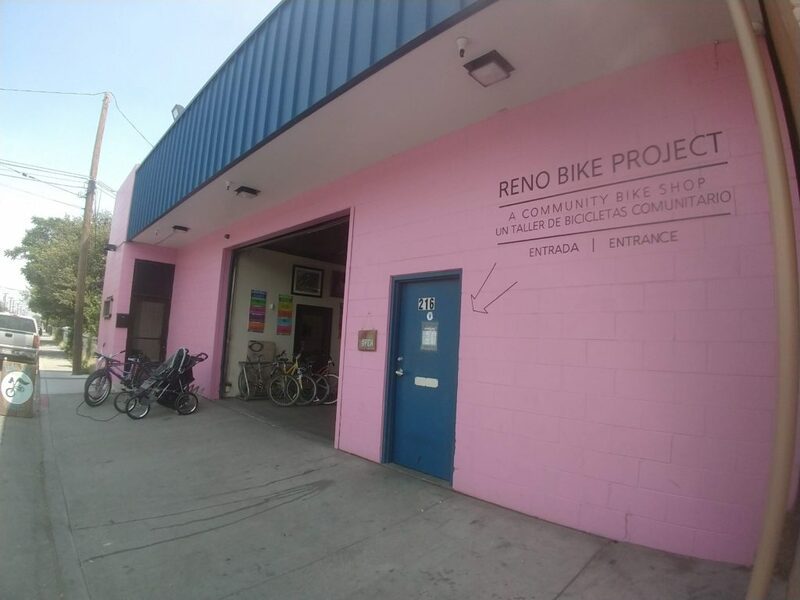 Reno Bike Project maintains a Safer Space set of policies to set the expectation that everyone in our shop is treated respectfully and equitably. Our community guidelines are posted in the public workstations, and can be read here in English o en Español. Do-It-Yourself RBP encourages people to learn to fix their own bicycles in order to inspire self-reliance, self-confidence, the passing-on of knowledge, and—ultimately—more butts on more bikes, more often. We facilitate this by providing six fully-equipped workstations for public use. 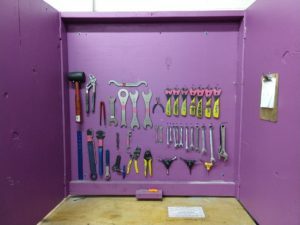 We ask for a $5-10 an hour donation for the use of a public workstation (a repair stand, complete toolset, access to specialty tools, rags, cleaner, and lubes), and Mechanic Educators offer assistance in teaching you how to perform maintenance and repairs, and use tools properly. However, in the interest of maximum accessibility, public workstation fees are waived every Second Saturday and Wednesday mornings—see our 2019 Gratis Time schedule here. 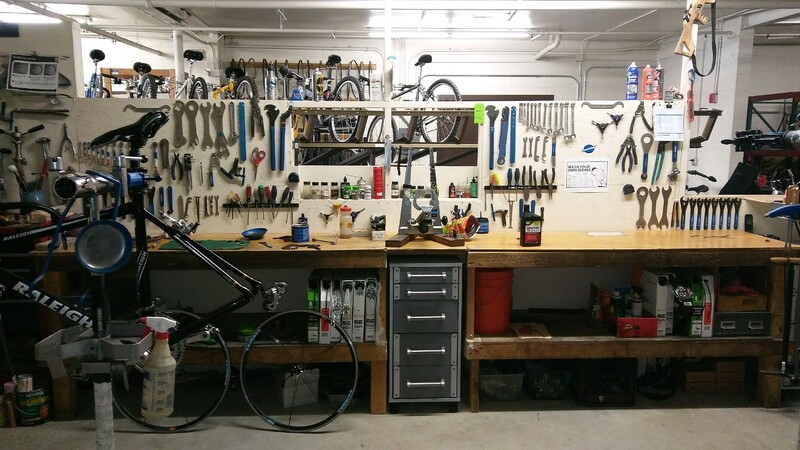 Come learn the joys of fixing your own bike. Brands we carry Because all of our bikes are donated we carry virtually every brand including Giant, Specialized, Trek, Schwinn, Miyata, Nishiki, Suntour, Centurion, Cannondale, Peugeot, Gary Fisher, Raleigh, Bianchi, Diamondback, Univega, and many more. Overhauled Bikes RBP sells fully refurbished bicycles—”Overhauls”—of all styles. These bicycles receive a full rebuild and minimum $100 in new parts (chain, tubes, tires, cables, etc.). Prices vary depending on the bike, new parts parts, and labor put into it. Purchase comes with a one-year Pedaler Membership. Overtuned & As Is Bikes RBP also sells “As Is” bicycles, as they come to us. These bikes are always checked over for frame damage and integrity, but generally still need work. Some bikes receive a tuneover, still short of a full overhaul, and are priced accordingly. Purchase comes with a free day in the public workstations to make repairs, adjustments, and upgrades. Kids’ Bikes Our selection of kids bikes ranges from 12″ – 20″. New Parts and Accessories RBP carries a limited selection of new parts and accessories, mainly the parts that often need replacing: tubes, tires, chains, cables, cassettes, handlebar tape, grips, etc. This inventory may change depending on customer demand. 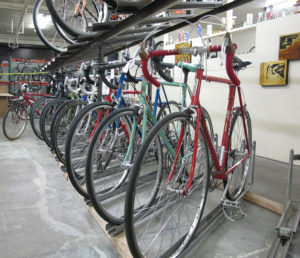 We also stock essential commuter accessories including lights, locks, pumps, patch kits, racks and baskets, and more. We have the ability to special order nearly any part on request. Used Parts Some donated bikes are unsafe or impractical to rebuild. 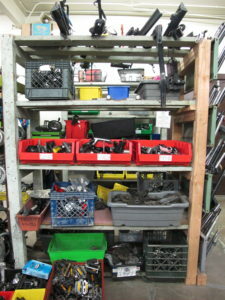 These bikes are stripped of all their usable parts, which we then sort and sell for $3-$15. Occasionally, rare or very nice parts are sold for slightly more. Repair RBP provides full-service repair based on a $75/hour rate. We give an estimate of the total cost of repairs when bikes are dropped off at the shop. If we can’t work on your bike for any reason we will refer you to another shop that will. 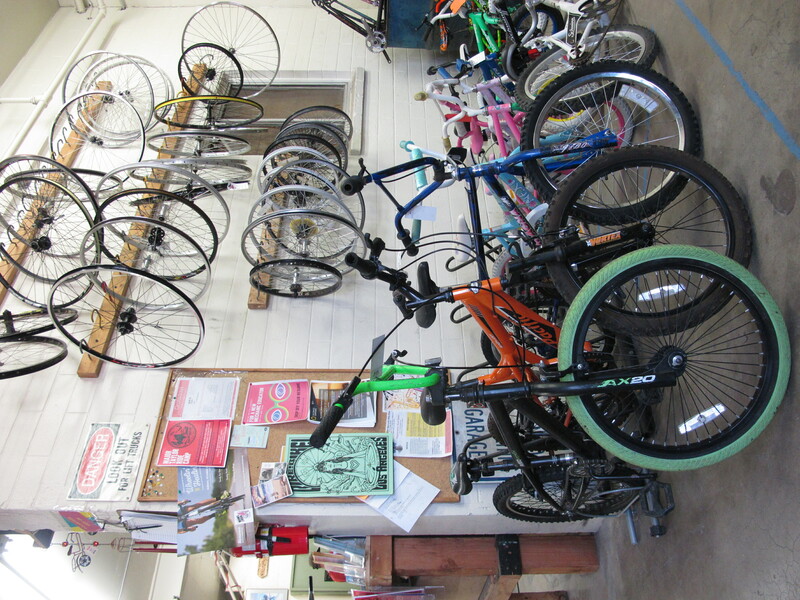 At this time, we are best equipped to fulfill your bicycle service needs at our Grove St. shop. Please bring repairs you want us to complete to that location. Information RBP believes that information is the cornerstone for growth. 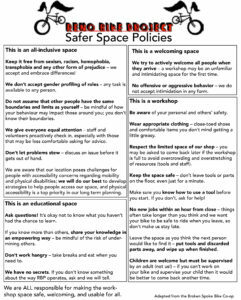 We provide knowledgeable opinions and advice for anything bicycle-related, and offer informational pamphlets and literature on bike mechanics, safety, riding, and entertainment. 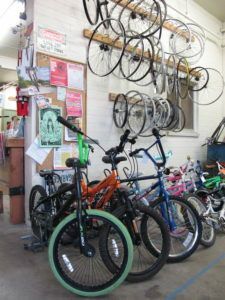 Bicycle Donations RBP accepts unwanted and broken bicycles as well as parts and bike-related accessories, which can be considered a tax-deductible donation. We will issue a donation receipt.